One of my most popular posts to date is my Nashville photo series.I documented each hour of what turned out to be a 15 hour road trip (in one go, I might add) from New York to Nashville. Strangely enough, I never shared anything else from that trip, and I’m not sure why. So today, in true Esra Sevgi fashion, we’re breaking down a weekend in Nashville! As many of you know, my days of gluten are behind me; however, at the time of this trip it was not an issue. It would be an absolute shame not to include the wonderful, albeit gluten-filled, foods of this trip, so they’ll be shown and recommended in all their glory. ○ Imogene and Willie If you've done any research into Nashville, this store is practically always mentioned. Of course, I did zero research before our trip because Falon had visited before so I let her take the lead. Wonderful interior, super friendly staff, and quality items. I bought one of their classic Nashville shirts, which has been extremely well loved since. ○ Amelia's Flower Truck Often parked right outside Imogene and Willie, Amelia's Flower Truck is iconic (however it does move around so I recommend checking their website for the schedule). It's a flower shop on wheels and they hand craft extraordinary bouquets. We didn’t buy any flowers because we didn’t exactly have anywhere to put them, but part of me wishes we did anyway. 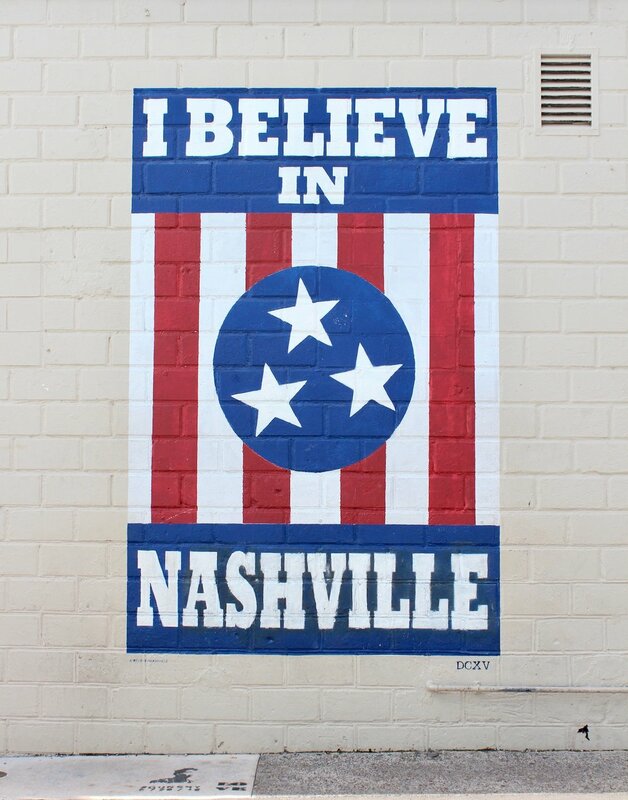 ○ "I Believe in Nashville" street art Does this even need further explanation? It's huge and so aesthetically pleasing. Taking a picture although not required, is highly recommended. ○ Burger Up It still surprises me that Burger Up made it into my Nashville recommendations mainly because I'm not a big burger person by any means. However, Falon and I had a craving and I'm so happy we did because it ended up being one of my favorite meals of the entire trip. I got a turkey burger, Falon got a fried chicken sandwich, and they were both fantastic. * HEY apparently the have GF buns! Score. I'm a sucker for a good coffee shop aesthetic -- something Barista Parlor completely nails. Not only was the atmosphere great, but so was the coffee (the important part). Coffee shop food can be really hit or miss, but I had the peach waffles (nothing like southern peaches) and they were fantastic. Broadway strikes me as the Times Square of Nashville; tons of neon signs and lined with bars (seems to be super popular among bachelorette parties). I wasn't 21 at the time of our trip so we went during the day and it was really cool to see. You can walk from downtown to the pedestrian bridge that spans the Cumberland River. It's really beautiful both during the day and at night -- I wish I had a picture of the bridge, or the view from the bridge, to share with you guys, but I surprisingly didn't take any! Ah, Loveless. It is on every guide to Nashville that has ever existed/probably will be on every future guide to exist as well, and for good reason. Their biscuits are heavenly. I mean, just look at them. It's not technically in Nashville, but the drive outside the city is more than worth it.